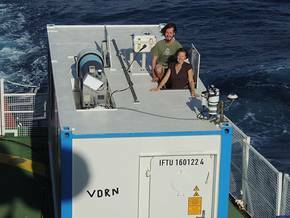 TROPOS scientists Dr. Heike Kalesse and Moritz Haarig with the TROPOS OCEANET container. For the 16th time, the OCEANET-project was taking part on a German research vessel cruise on the Atlantic. This time, it was part of the North-South Transect of the AWI RV Polarstern from Bremerhaven to Cape Town. Two scientists of the ground-based remote sensing group of TROPOS - Dr. Heike Kalesse and Phd student Moritz Haarig - have been on board to observe profiles of temperature and humidity, atmospheric aerosols, clouds, and solar radiation with a focus on the contrast of the polluted northern hemisphere and the more pristine southern hemisphere. Besides sea salt aerosol in the marine boundary layer, they observed mineral dust and biomass burning aerosol transported by trade winds from the Sahara along their way West of Africa. 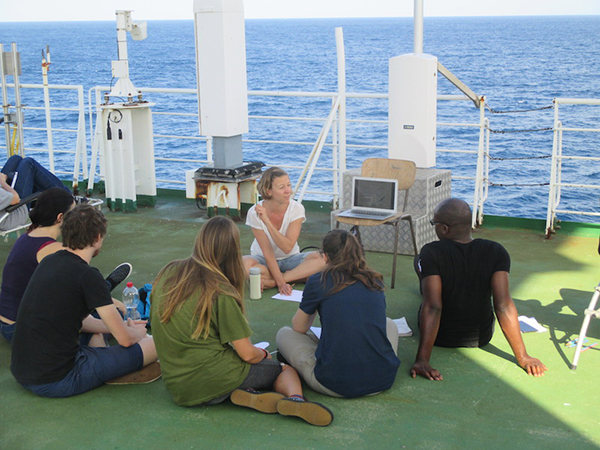 Teaching onboard RV Polarstern in the frame of the NoSoaT training school (The North South Atlantic Training Transect). On board, Heike Kalesse and Moritz Haarig were also involved in the NoSoAt training, which is taking part for the second time onboard the RV Polarstern. This program is collaboration between the Alfred Wegener Institute (AWI), the Strategic Marine Alliance for Research & Training (SMART) and Partnership for Observation of the Global Oceans (POGO). It is funded through the Nippon Foundation. 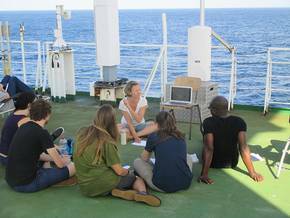 25 master- and Phd students from all over the world with backgrounds ranging from marine biology to paleoclimatology are getting hands-on training on ocean measurements, remote-sensing, ocean law, meteorology and climate change as well as arts. Within the frame of this student-training program, Heike Kalesse and Moritz Haarig gave lectures on atmospheric remote sensing and do hands-on exercises and data analyses with the OCEANET instruments such as the portable multi-wavelength-lidar PollyXT and a HATPRO microwave radiometer. In order to be able to do statistical evaluations, continuous measurements within the OCEANET projects is important to increase the number of ship-based remote-sensing observations of the lower troposphere where data availability is still sparse. Especially for detailed studies of the marine boundary layer, ship-based observations can give more insight into the exchange processes between ocean and atmosphere. 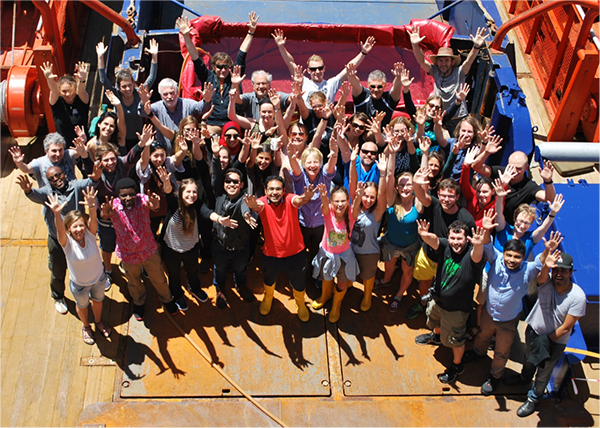 Group picture on the North-South Transect of the AWI RV Polarstern from Bremerhaven to Cape Town (PS102).